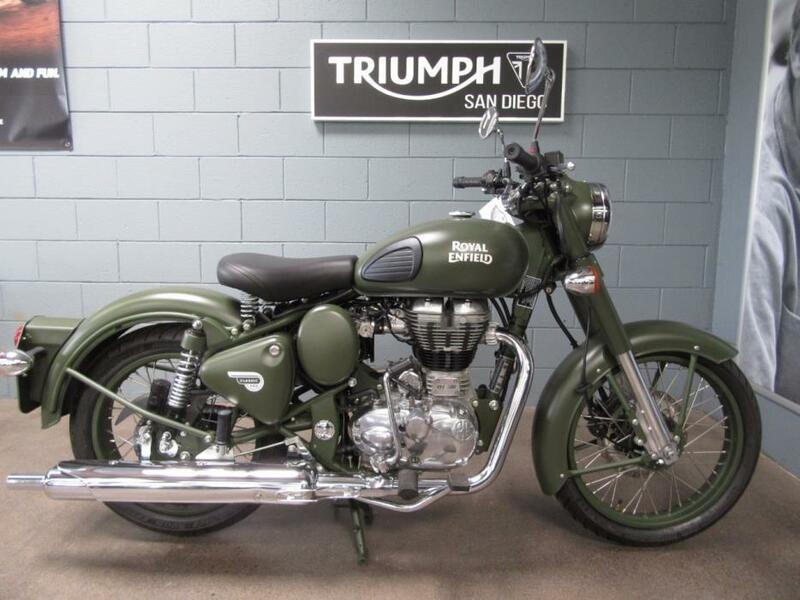 The Military is painted all matte olive drab and comes with metal panniers (saddlebags) and crashbars standard. All models come with our new five-speed transmission and electric starter as standard equipment. 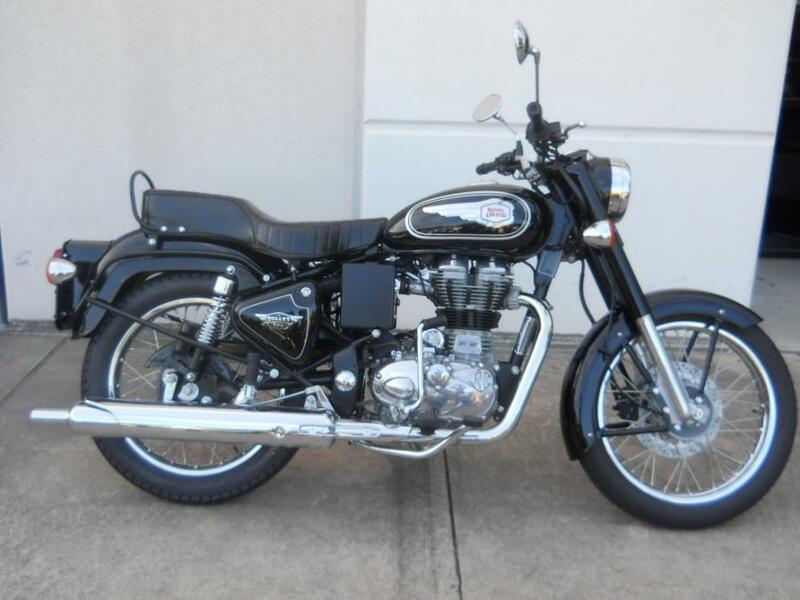 JUST IN.... 2015 Royal Enfield Bullet Classic C-5Adult Owned & Ready to Go.Has That Real Classic Look and Feel.Call Randy 855-832-3003 TODAY!!!!! 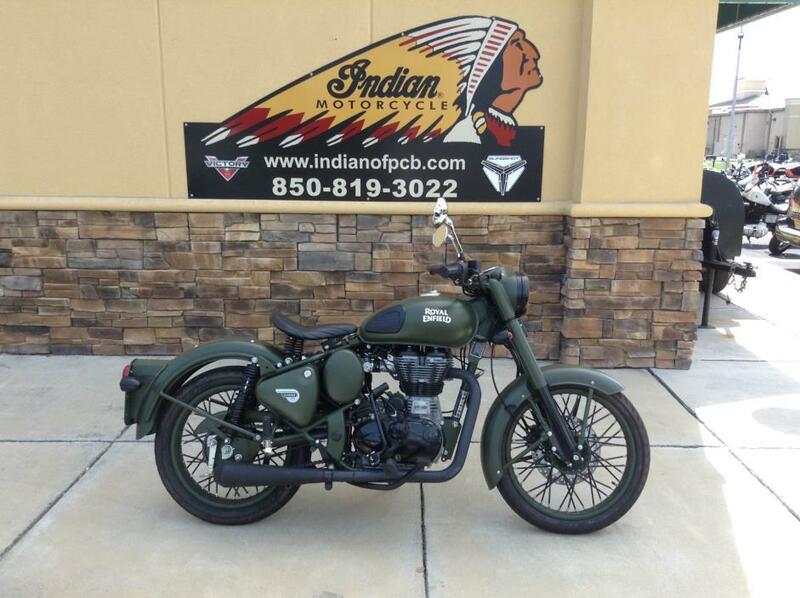 2009 Royal Enfield Bullet G5 Classic EFI Hammarhead Woodsman Custom Scrambler MotorcycleCustom built in 2012 from a brand new 2009 Royal Enfield Bullet G5 Classic EFI UCE Engine FUEL INJECTED! !YOUTUBE VIDEO: https://youtu.be/-loGisSrx54For sale is a super rare used custom HAMMARHEAD WOODSMAN SPECIAL$7,750 OBO (originally built for $11,500)Cash or wire only. No Paypal, no checks.Clear and Clean NY Title. Inspected until April 2018.MILEAGE: 6600 barely used miles. 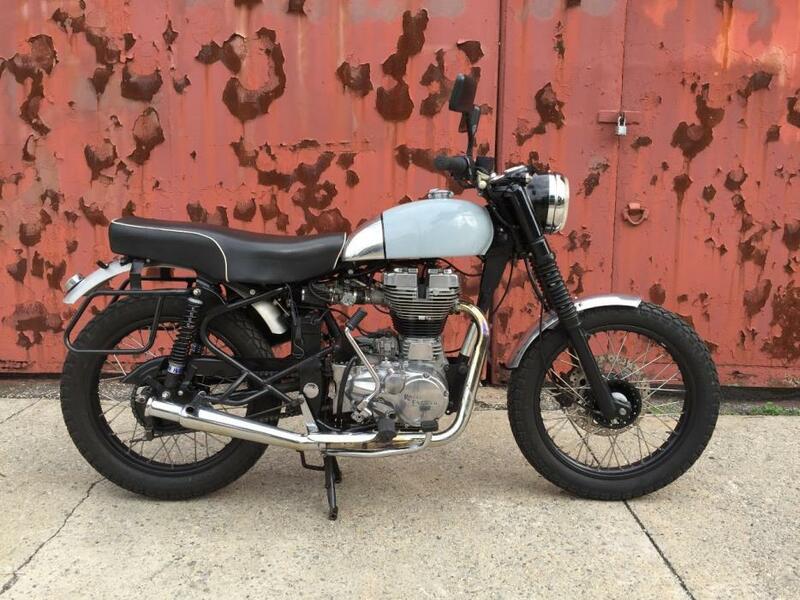 500 cc single cylinderCustom motorcycle shop Hammarhead Industries existed from 2010 to around 2013, in Philadelphia, PA. Owner James Loughead (aka James Hammarhead ) unfortunately closed the business and only produced a small quantity of these custom bikes. he was also known for his custom Triumph Scrambler: The Jack Pine. Google: Hammarhead Industries Motorcycles for more info.http://www.bikeexif.com/triumph-t100http://www.bikeexif.com/motorcycle-wallpapers/hammarheadOld Tumbler: http://hammarhead.tumblr.com/Awesome super chic bike great for city or country roads.I always get stopped every time I take this beauty out. Loves to live around 55 mph up to 65 mph. Can go up to 80-90 but with a single cylinder vibrations kick in! 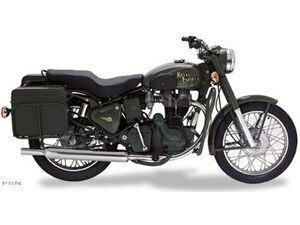 Part of the Royal Enfield character. ENGINE / CONDITION:Engine starts and kicks on first try all the time. 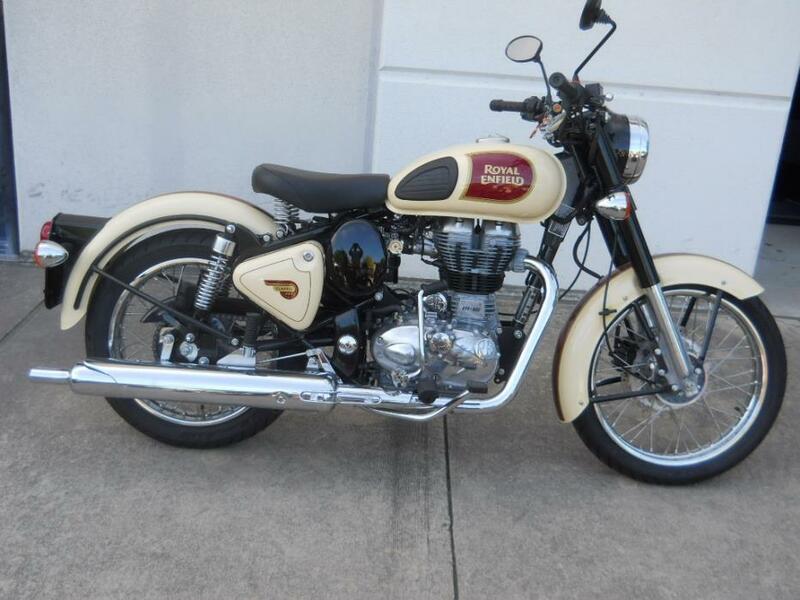 Fuel Injected with electric AND kick start.Runs excellent. No issues. I never hesitate to take out on 150 -- 250 miles day trips on upstate country roads. Slight marks, pitting as one would expect from a used bike, but mostly in excellent condition.Must witness in person the clean lines and unique character.CUSTOM MODS FROM STOCK:powder coated front and rear wheel hubs and rims satin black; custom exhaust with British Tulip silencer; Dunlop K70 front and rear tires; British dual sport seat with white piping; Removed airbox / new K&N air filter; 9" headlight kit with Philips high output white bulb; Custom aluminum front and rear fenders; LED brake light; Battery relocation kit; LED turn signals; Front turn signals relocated to integrated cowl parking lights; Relocated horn; Progressive front fork springs; Anodized passenger foot pegs; British custom alloy tank custom painted dove grey with black strip and chrome showing through; Side saddle bag racksRECENT UPGRADES:Recent full service, oil change at a Royal Enfield dealership in the Catskills NY @6500 miles. ; New front and rear sprockets and chain; new seatThis is a RARE bike and needs a quality home who will appreciate her beauty.Happy to share any experiences I've had with this gem. hate to part with her, but making way in the stable for a larger dual sport. No test rides. 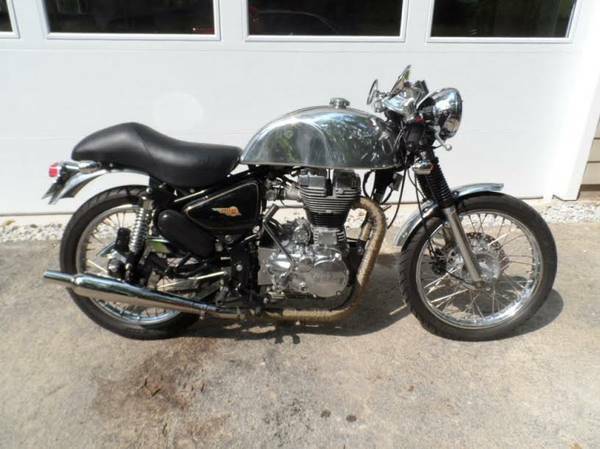 2014 Royal Enfield Continental GT, 7235 Miles, 535 cc, electronic fuel injection, cafe racer style. 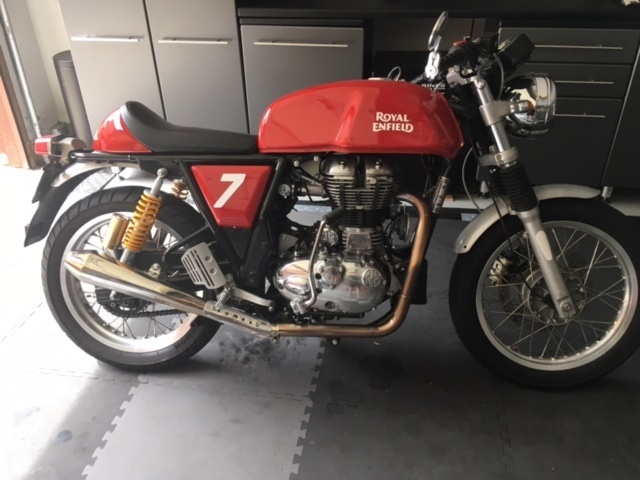 Upgraded exhaust and mirrors, all maintenance work done by Carpy's Cafe Racers in Anaheim. 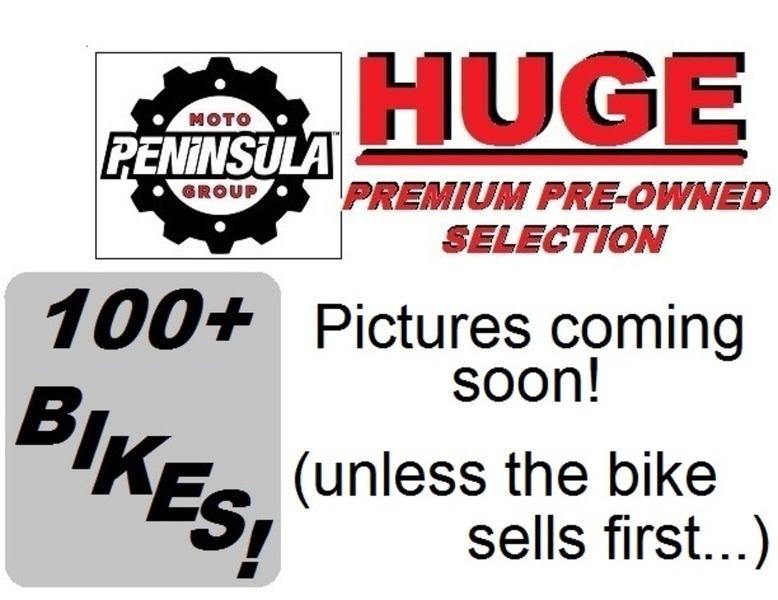 Job relocation forces sale, fun bike, sad to see her go. 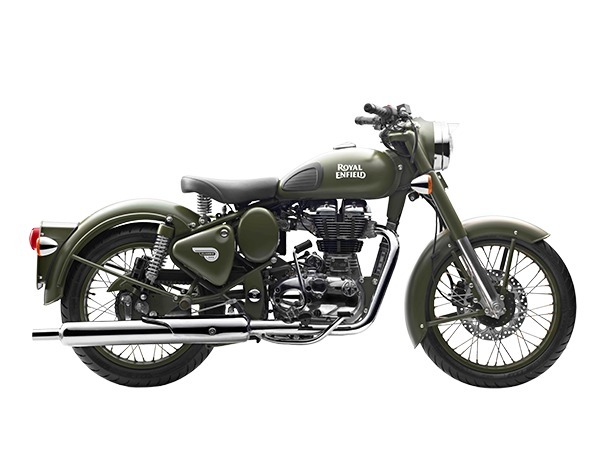 2017 ROYAL ENFIELD BULLET 500, FOR EIGHT DECADES,RIDERS HAVE BEEN DRAWN TO THE PURPOSEFUL STYLE AND READY-TO-GO RELIABILITY OF THE ROYAL ENFIELD BULLET. AS THE LONGEST CONTINUOUSLY PRODUCED MOTORCYCLE IN THE WORLD,ITS UNIT CONSTRUCTION ENGINE[UCE] IS FIRED BY AN ELECTRONIC FUEL INJECTOR FOR BETTER COMBUSTION,POWER DELIVERY AND FUEL ECONOMY. THIS IS PURE MOTORCYCLING REFINED,REFRESHED AND READY FOR THE NEXT GENERATION OF SEEKERS. Thanks for looking and we will see you soon. 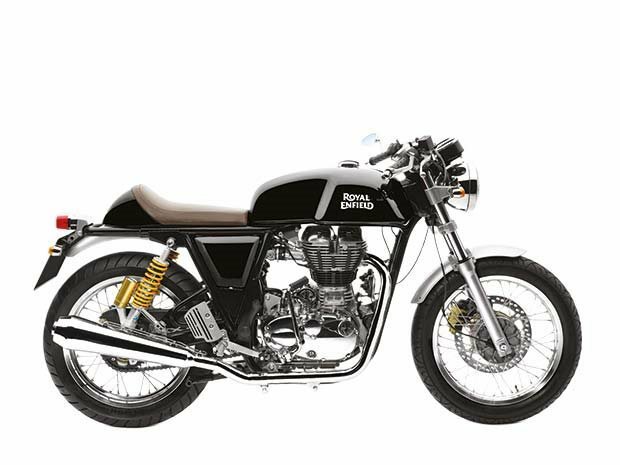 Armed with a potent fuel injected 500 cc engine and clothed in a disarmingly appealing post war styling, this promises to be the most coveted Royal Enfield in history.For those who want it all. The power, the fuel efficiency, the reliability and simple, yet drop dead gorgeous classic styling. The classic turns heads not because it wants to but because it can’t help it. 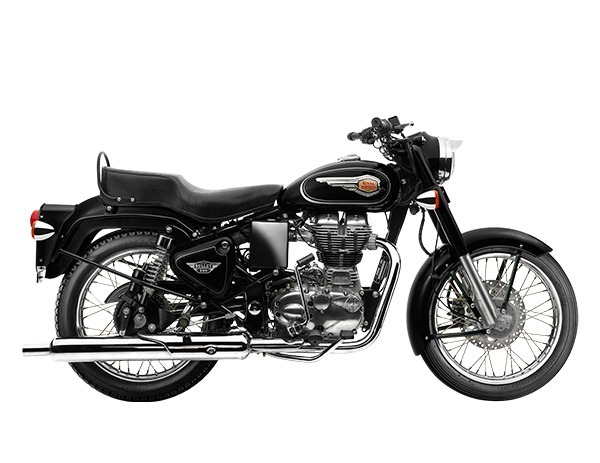 You will appreciate the beat not just for the music it creates but also for the muted feeling of strength and power that it signifies.The view is simply better when you are astride a Royal Enfield Classic 500 – whether moving or still. Nothing more to be said. 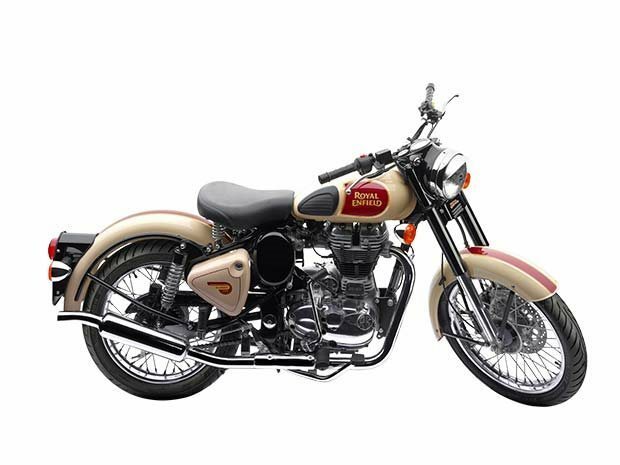 2016 ROYAL ENFIELD CLASSIC 500, A PURPOSE BUILT MACHINE COMMITTED TO THE PURPOSE OF HAVING A GOOD TIME.SOMETIMES IT SEEMS AS IF TRADITION IS CALLING OUT TO YOU,SAYING 'LET'S GO FOR A RIDE. Thanks for looking and we will see you soon.